Comment: This item shows wear including stain spots. "The phrase jazz dance has a special meaning for professionals who dance to jazz music (they use it to describe non-tap body movement); and another meaning for studios coast to coast teaching 'Modern Jazz Dance' (a blend of Euro-American styles that owes little to jazz and less to jazz rhythms). However, we are dealing here with what may eventually be referred to as jazz dance, and we could not think of a more suitable title. "The characteristic that distinguishes American vernacular dance--as does jazz music--is swing, which can be heard, felt, and seen, but defined only with great difficulty. . . ."
Artists like Bill Robinson, King Rastus Brown, John Bubbles, Honi Coles and others who speak to us in this book, are our Nijinskys, Daighilevs, Balanchines, and Grahams. There are so many books on ballet and modern dance. There are still a few on tap dance and they are so cavalierly allowed to go out of print even though the interest in them is so deep and sustaining. The late Marshall Stearns was author of The Story of Jazz, and was the founder of the Newport Jazz Festival and Institute of Jazz Studies. He was also a professor of English at Hunger College in New York and a medieval literature scholar. He died in 1966 while completing his book Jazz Dance co-authored by his wife Jean. Jean Stearns is an authority on jazz and assisted her late husband Marshall in researching and writing Jazz Dance. 5.0 out of 5 starsEvery tap dancer should read this book! An easy read, though not especially coherent or well written, this book has increased my understanding and appreciation of the art form and it's roots. The book is full of useful information and makes me appreciate the social history, racial struggles, and artistic timeline of tap. Like others have said, it's not a how-to (it doesn't profess to be), so it'll be helpful to have a little background and know a few basics (or have access to YouTube!). If you want to be a dancer and *understand* what you're actually dancing, this is an essential read. It made me appreciate all that's been passed down to me through the years, which I would otherwise take for granted. Wonderful book so far. I am truly enjoying the history and how certain dances got started. This book should live on in history through us dancers!!!!! Dear reader, if I believe what Frankie Manning said (from a friend of mine), this book has a bit of exageration concerning the cotton club.the violence was not that bad at the time. Saying that, it is a great book to have a almost accurate view of the history of dance in America. I am myself a swing teacher, dancer and choreographer for over 30 years and I do appreciate good books like this one, because it is one thing to perform a style of dance, but it is another to understand where it comes from. Bravo! As an lindy hop dancer and tap dancer I was very happy to read this book. It's very detailed on the history of Afro-American culture. Gave me a lot of new intresting stuff and new details to things I heard before. 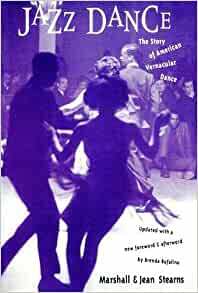 There is no other dance book on the market (and thank heavens that this one has remained available since it was first published in 1968) that is as useful, delightful to read or as authoratative as Marshall & Jean Stearn's "Jazz Dance". Indeed, it is, in my opinion, one of the best books ever written about any facet of show business. Vernacular dance in 20th century America wasn't represented or devised solely by a handful of the best remembered: Vernon & Irene Castle, Bill Robinson, Fred & Ginger, Eleanor Powell, Hal Le Roy, the Nicholas Brothers, Gene Kelly, Ann Miller, Donald O'Connor and Bob Fosse. From the age of variety saloons and minstrelsy through a century of vaudeville and nightclubs, there were hundreds of dancers, black and white, female and male, who contributed to the development of American vernacular (or jazz) dance. Hoofers invented, borrowed, stole and adapted rhythm steps, jumps, slides, contortions and even style from each other---and American dance became richer for their efforts. Marshall Stearns understood that. Instead of choosing to write about the best known dancers of his day, the ones blessed by luck, Stearns took on the nearly impossible task of interviewing every dancer of ability he could locate. Some like King Rastus Brown, Ginger Wiggins and Groundhog were remarkable talents known only by a very few--most of whom were other dancers who held them in high esteem. Others like John Bubbles, Ida Forsythe, James Barton, Pete Nugent, Eddie Rector, Alice Whitman, Willie Covan and Harlan Dixon were peerless dancers of their day but forgotten despite years of stardom. Mr. Stearns brought more than a hundred fine hoofers to tell their stories to readers and dance enthusiasts. Stearns wove those stories together without forcing themes and, within the warp and woof of his narrative, emerged bits of social history and showbiz lore, explanations of certain dance steps, claims and counter-claims as to origins and originality, faulty recollections and all but forgotten gems of clearly remembered facts. Many reputations emerged brightly restored in luster while others, perhaps more famous, proved less admired by professionals who had more discerning views than fans with less knowledge of dance. Whenever I need to check a fact about vernacular dance--jazz dance or tap--I turn first to Marshall Stearn's invaluable book. founder, American Vaudeville Museum publisher of "Vaudeville Times"
I second everything Frank Cullen says about this book. I first read it over thirty years ago, acquiring my own copy some years later. Not only is it a great book on American show business,it makes great reading for anyone interested in all facets of New World music and dance culture. I frequently reccomend this book to fans of American music in general, be it jazz, blues, rock 'n' roll, country, Latin etc. etc. After reading the Stearns' wonderful book, one sees that, no matter how well-versed in the musical lore of the Americas one is, it is all a bit two-dimensional without the perspective offered by 'Jazz Dance'.